Please refer to our stock # 128 when inquiring. "Vacance" oil on canvas 29" x 36" Yolande Ardissone was born in Normandy in 1927, of an Italian father and a Ukrainian mother. At the age of seventeen, she left for Paris to study at the “Ecole des Arts Appliques” and the “Academie de la Grande Chaumiere”. Two years later, she transfers to Ecole des Beaux-Arts and studied in the Atelier of Unterstellar. Soon after that, she traveled to Italy , Spain , Algeria , Holland , Indonesia , Egypt , Haiti , China , Thailand , Russia etc. Though she has traveled throughout the world, Ardissone is primarily a painter of Brittany . 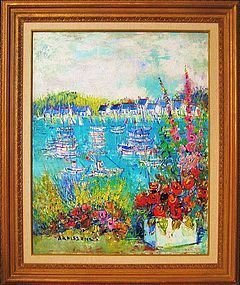 Her vivid, impressionistic style was strongly influenced by Gauguin, Renoir and Van Gogh. Her canvasses are painted with a mature technique, forcefully, with textured paint radiating a natural and joyful dynamism. Her painting has a lot in common with the Fauves. This is understandable, when you see her strongly colored palette ,and the spontaneous expression of what she feels with her brush she transmits forcefully. Her works have been acquired by the Ville de Paris, the Musée de l'Ile de France, the Musée de la Marine, l'Etat etc. The Ville de Paris has awarded her the Médaille d'Argent.